This “miracle in a bottle” isn’t messing around! You dab on blotting papers like crazy, your supposedly matte makeup turns slick after lunch, and your skin's natural sheen becomes the enemy even if it can sometimes pass as a dewy highlight—these are the struggles only girls with oily skin can relate to. As it turns out, applying oil on your skin can actually help balance out your skin’s natural oil production. Before you say "WTF?" we totally get you: The last thing you want to put on your face is *more* oil. But that's where argan oil comes in. It reduces oil production in your skin. Your skin produces sebum to compensate for the lack of moisture on it. The high levels of vitamin E in argan oil help control your skin's oil production by balancing out your sebum levels and providing the right amount of moisture on your skin. It keeps your skin moisturized. Argan oil is lightweight and non-greasy, so it's absorbed quickly by the skin without leaving an oily residue. A natural oil, it also softens and protects the skin, so it’s suitable as a day moisturizer and an overnight treatment. It can double as a makeup remover. If you're tired of using chemical makeup removers irritate your skin, then argan oil is a welcome substitute. It won't burn your eye area, even in direct contact. The best part? It can also rid your skin of impurities from pollution and smog. It helps prevent acne breakouts. Due to its non-comedogenic nature, argan oil won’t clog your pores, so you can rest easy knowing that it wouldn’t lead to acne breakouts and blackheads. Argan oil’s high linoleic acid content can even help subdue acne-causing bacteria and reduce inflammation. The vitamin E in argan oil, along with hard-working fatty acids, improves the elasticity of your skin, helping prevent and reduce signs of stretch marks. It can be used to treat some skin conditions. Loaded with various antioxidants, argan oil is an excellent anti-inflammatory agent. Not only does it treat acne and acne scars, but it can also help soothe symptoms of psoriasis, atopic dermatitis, and eczema. It can speed up your skin’s healing process. The antibacterial and anti-fungicidal properties of argan oil—when combined with vitamin E and antioxidants—can also help speed up the healing process of infections, wounds, burns, and bug bites. It can help lessen dandruff and treat dry scalp. Dry scalp and flakiness are often the results of using hair products that strip your scalp of the natural oils needed to keep hair shiny and healthy. Rich in vitamin E and fatty acids, argan oil can help moisturize and revitalize your dry scalp and eventually lessen dandruff. 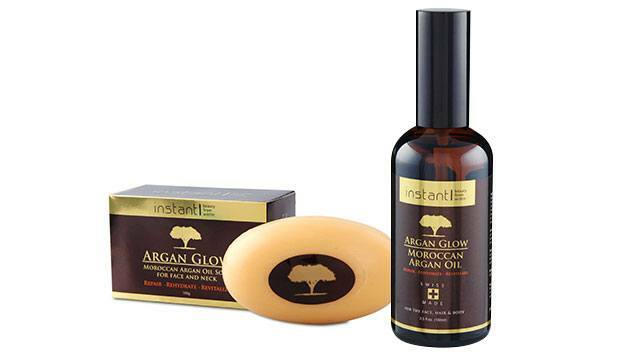 Instant Argan Glow Oil and Instant Argan Glow Soap both contain pure Moroccan argan oil that’s beneficial for oily skin as well as other skin types. Instant believes that achieving "beauty from within" entails producing eco-sustainable, cosmeceutical, and nutraceutical skincare. It aims to enhance one’s natural beauty through formulas and blends from only the finest natural ingredients. For more information, follow Instant on Facebook. Instant Argan Glow Oil and Instant Argan Glow Soap are available in Watsons stores nationwide and online on Lazada. This article was created by Summit Storylabs in partnership with Instant.